The atmosphere in the Finish Area at today’s prize giving ceremony for the legendary Downhill was fantastic. 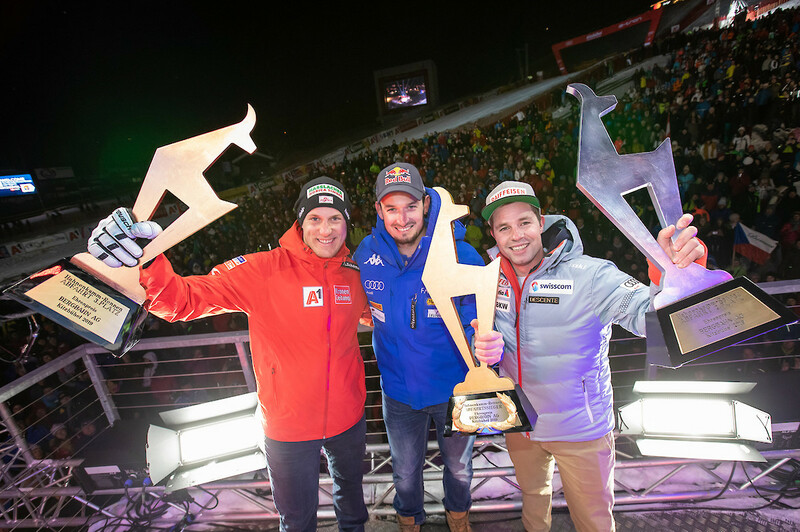 The top 5 racers marched onto the balcony and were celebrated by their countless fans, Downhill champion Dominik Paris beaming the most. The Italian athlete raised his golden “Gams“ trophy into the air and the crowd exploded with applause. Beat Feuz from Switzerland was also greeted with cheers and Otmar Striedinger, today’s top Austrian racer, was thrilled to receive his first Kitzbühel trophy. Another highlight was the traditional bib draw for tomorrow’s Slalom. Anticipation among the athletes is on the rise: “I’m going to give it my all. I think it’s good that the Slalom is on a Saturday for once “, Marcel Hirscher enthused, who will race with bib number 5 tomorrow. Another favourite is Henrik Kristofferson from Team Norway, sporting bib number 7. The two Austrians, Feller and Matt, will be starting second and third. French athlete Alexis Pinturault will be the first to race. The first run will start tomorrow at 9:30 hrs, followed by the second run at 12:30 hrs. Excitement is guaranteed!